Definition 132 : Let x(u,v) be a surface, and N(u,v) the normal with length 1 (in the direction of xu⊗xv). Let hi j = xuiuj . N (with u1 = u, u2 = v). Then we call h1 1 (du)2 + 2 h1 2 du dv + h2 2 (dv)2 the second fundamental form. Explanation 133 : Let α be the tangent plane in the point xo with parameter values uo and vo, and α ' the plane parallel to α at a (little) distance γ from α, and let k be the intersection curve of α ' and the surface. For the points on k we have x = x(u,v) and (x - xo + γN) . N = 0. Using Taylor we find x - xo = xu du + xv dv + (1/2) xu u (du)2 + xu v du dv + (1/2) xu v (dv)2. ((1/2) xu u (du)2 + xu v du dv + (1/2) xu v (dv)2) . N = - γ, so h1 1 (du)2 + 2 h1 2 du dv + h2 2 (dv)2 = -2γ. This is (in coordinates with respect to a not necessarily orthonormal base xu , xv) the equation of a conic, in which the right hand side is the second fundamental form. Definition 134 : We call the conic h1 1 (du)2 + 2 h1 2 du dv + h2 2 (dv)2 = 1 indicatrix of Dupin. 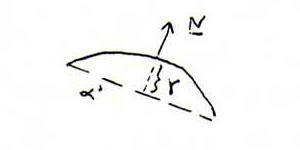 1. hyperbolic points: det(hi j) negative. (Then we can resolve the form in linear factors, and Σ hi j du dv = 0 gives the asymptotic directions, see our course of projective geometry). 2. parabolic points: det(hi j) = 0. (Indicatrix exists of two parallel lines; for example (2du + 3dv)2 = 1 gives du = +(1/2) - (3/2)dv, so indicatrix xu (+(1/2) - (3/2)t) + xv t.
3. elliptic points: det(hi j) positive. (Then we can't resolve the form and there are no asymptotes). Problem 135 : Do you know a surface on which each point is navel point (umbilical point), that is: the indicatrix is in each point a circle? Check this by calculation. Do you know a surface on which each point is planar, that is: the second fundamental form is everywhere the 0-form? Check this by calculation. Problem 136 : Determine the second fundamental form of the torus and check that det(hi j) = R cos(φ) (r + R cos(φ)). Deduce that the points at the inner side of this inner tube of a bicycle are hyperbolic, and the points at the outer side elliptic. The points on the circles φ = +π/2 are parabolic. Problem 137 : Consider the right helicoid surface ((a+u)cos(v), (a+u)sin(v), bv), see 128. Show that the parameter lines are asymptotice lines (that is: they have in each point an asymptotic direction), and form an orthogonal net, so each point is hyperbolic with an orthogonal hyperbola as its indicatrix.